Original Pancake Cake Recipe .In this year's cake which was crowded rumored is Pancake, soft cake which had a variation banya are snacks that you ought to try. 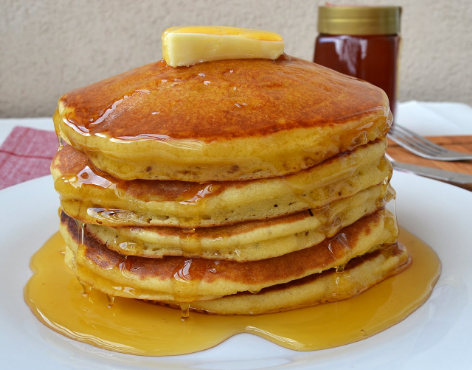 This pancake cake originated in England in the 1400s, but has been developed in various countries. French pancakes known as crepes, in the Netherlands known as Pannenkoek, in Slovakia known as palacinky, while in Indonesia itself is known as a pancake. Already pancake tell us where it came from? Now Chef will try to make pancakes original so you could add a bit of variety. First of all material shake the flour, baking powder and salt in a bowl. Prepare another bowl to mix the milk, vegetable oil, honey and eggs, stir all ingredients until frothy. Combine all ingredients and shake gently. Fewer small granules of starch leave it alone. After that enter the mixed material earlier in the cooler or refrigerator for 30 minutes, not to 2 hours. When you pull out the dough, there should be bubbles and do not be shaken again leave it like that. Prepare a pan that has been spread with vegetable oil, then wipe pan with paper towels before. At least you'll be a bit of experimenting to determine an ideal temperature in order to cook the dough pancakes. The trick is when you shed a little water and boiling water was not fast, it means the pan is ready for use. Pour the batter into the pan a little scary, but still sisahkan much space so as not difficult to reverse it. Then when the edges of the pancake was dry and colored brown, turning with a spatula. Make sure you've got all the parts are in the top pancake spatula, if it is then it will be easier to membalikannya. Wait until the other parts dry, then you are ready to serve the pacake. When you've found the right temperature, your homemade pancakes definitely feels good and tasteful. For variation you can add the powdered sugar with dried or fresh fruit. You can also add a splash of ice cream with fruit jam. 0 Komentar Untuk "Original Pancake Cake Recipe"